Department of Energy (DOE) Secretary Alfonso Cusi said today that the Philippines endeavors to add at least 20,000 megawatts of renewable energy (RE) capacities by 2040 to sustain economic gains and continuously elevate the quality of life in the country. Cusi issued the statement during the launch by the DOE and the International Renewable Energy Agency (IRENA) of the Renewables Readiness Assessment (RRA) for the country at the Energy Center at Bonifacio Global City. “RRA is a collaboration among the DOE, IRENA and other renewable energy stakeholders from both the public and private sectors. It is vital in our vision towards attaining 20,000 megawatts of renewable energy capacities by 2040,” said Cusi. He said that formulating RRA involved research, interviews, focus group discussions and several multi-stakeholder consultations. The goal, he added, is to provide a comprehensive and detailed analyses of the country’s RE profile in order to recommend measures to deal with the pertinent issues in the industry. Cusi said that the Philippine RRA will also contribute to a database of the status of renewables readiness across member countries of IRENA. The DOE-Renewable Energy Management Bureau (REMB) also prepared the launching ceremony of the RRA to serve as a forum with industry stakeholders to inform them on its results, solicit their views in carrying out the recommendations and discuss opportunities and challenges of the RE sector. The launching was graced by DOE Assistant Secretary Roberto Uy, DOE-REMB Director Mario Marasigan, DOE-REMB Assistant Director Marissa Cerezo, National Renewable Energy Board (NREB) Chairperson Atty. Jose Layug Jr., IRENA Senior Programme Officer Gurbuz Gunol and IRENA Regional Programme Officer for Asia-Pacific Yong Chen. IRENA is an intergovernmental organization that supports countries in transitioning into a sustainable energy future. It serves as the principal platform for international cooperation and an avenue to explore other values of renewable energy as it promotes widespread adoption and sustainable use of all forms in the pursuit of sustainable development. “The DOE is committed to provide a level of playing field among RE developers to assure the country of its indigenous and sustainable energy for the consuming public,” said Cusi. 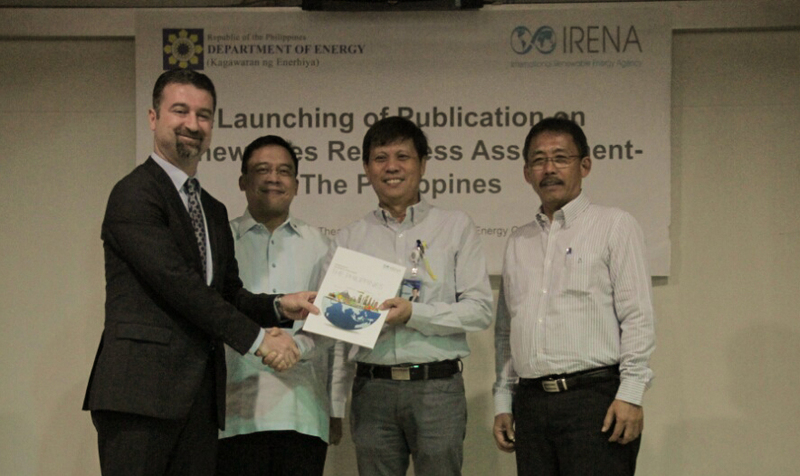 Cover photo caption: RRAP turnover: Gurbuz Gunol, IRENA Senior Programme Officer (left), turns over a copy of the Renewable Resource Assessment Publication to Department of Energy Assistant Secretary Robert Uy on Friday, 21 April 2017, in Taguig City. With them are NREB Chairman Jose Layug Jr. (2nd from left) and DOE-REMB Director Mario Marasigan (right).